My transplant journey began almost 19 years ago on April 29, 1997 when I was admitted to St. Paul’s Hospital in Dallas. That Mother’s Day, my family and I were told that my survival depended on getting a heart transplant. I struggled when I heard this announcement. I didn’t want to put my family through such an experience, nor could I accept the idea that that someone else would have to die for me to live. However, the decision to move ahead with the transplant became clear when my first two grandchildren were born, just six weeks apart. Looking into their sweet, newborn faces made me see clearly that a transplant was my chance to see them grow up, if even for a short time. Now, thanks to the ultimate gift from a person I will never meet, I have seen six grandchildren born – one is in middle school, one in high school and the other four have gone on to college. To say I’m a proud father and grandfather is an understatement. I am immeasurably thankful for my special donor family. On the tragic, heartbreaking day they lost their daughter, they also made the decision to give me a second chance. Thank you seems so small. But, one of the most meaningful moments of my life has been seeing the look on my Donor Mom’s face the first time she put a stethoscope on my chest and heard her daughters’ heart, still beating strong. And, though we still do that each time we get together, our first meeting stays with me. 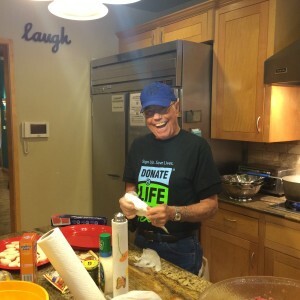 My Donor Mom’s smile and bravery encourage me and make it all worthwhile each time I volunteer by speaking to organizations and nursing students, cooking at the Ronald McDonald’s house, participating in Donate Life Day at the Capitol, or just talking with people about becoming registered donors. This year, I accumulated so many volunteer hours, LifeGift recognized me as their Fort Worth Volunteer of the Year. My first experience at the Transplant Games of America was in Houston 2014. Winning medals was secondary to the honor I felt just to be able to participate in the Games. I competed in one of my favorite hobbies – golf – and, being a native Texas, I felt compelled to compete in the Texas Hold’em Poker event. It was overwhelming to see so many lives touched by transplants and it was a powerful reminder that each recipient was there because of a Donor and their family. The fact that I can compete 19 years after my transplant means so much to me and inspires others about what a transplant can mean. But even more, being a person of HOPE is my way of honoring my beautiful Donor, her family and the true miracle their gift made possible.